(October 2, 2018) - The Cape Coral Police Department is seeking the public’s help in identifying a robbery suspect who forcibly threw the victim from his bicycle and then rode off with the bike. On September 19, 2018 at approximately 2:00 p.m., the victim was riding his bicycle at the 400 block of Old Burnt Store Road North. 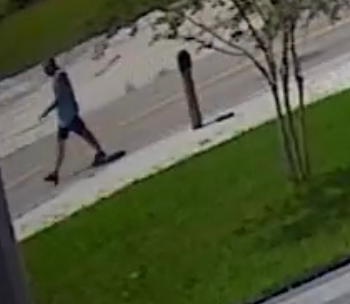 He observed a Hispanic male with short black hair, possibly around 5’10” 150lbs and in his mid-30’s, wearing a blue tank top, dark basketball shorts, and black sneakers walking southbound. As the victim passed the male he was grabbed from behind and thrown off his bicycle to the ground, injuring his elbow. The bicycle thief then rode away southbound out of sight. A detective with the Major Crimes Unit was able to secure video surveillance taken from cameras on houses in the area that shows the suspect walking just prior to the robbery occurring. If anyone has information on this suspect’s identity or whereabouts, please contact the Cape Coral Police Department at (239) 574-3223. You can also submit an anonymous tip. Go to www.capecops.com/tips or text a tip: text CCPD+"Your Message" to CRIMES (274637). Finally, you can call Crimestoppers at 1-800-780-TIPS.